What is the story of Bharat Mata? What's her connection with the Indian national flag? The Bharat mata is [primarily] goddess Durga. However in general she is an amalgamation of various goddesses. This is a rare combination of religion and nationalism (a part of Dharma). 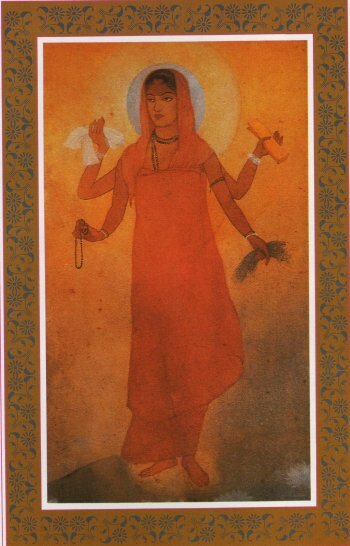 She is not a traditional Pauranic goddess. So in the oldest of paintings, there was neither tricolor flag with her, nor was there any lion. The flag started to appear around 1930's when the independence movement was at its peak as described in the above Wiki article. As we know Bhumi is considered as Mata according to scriptures. Also see this and this answer which discuss about location and praising of Bharat Varsha. So, Bhumi of Bharata have significance in scriptures and can be considered or worshiped as Mata (Mother). Now, talking about Bharat Mata, there is history of freedom movement and bit nationalism is connected with it. Kiran Chandra Bandyopadhyay first coined the term "Bharat Mata" as the title of one play/drama in 1873. In 1882 Bankim Chandra Chattopadhyay's novel Anandamath introduced the hymn "Vande Mataram" which soon became the song of the emerging freedom movement in India. In which he called Bharat Mata as Lord and equated her with goddess like Durga, Laxmi etc. 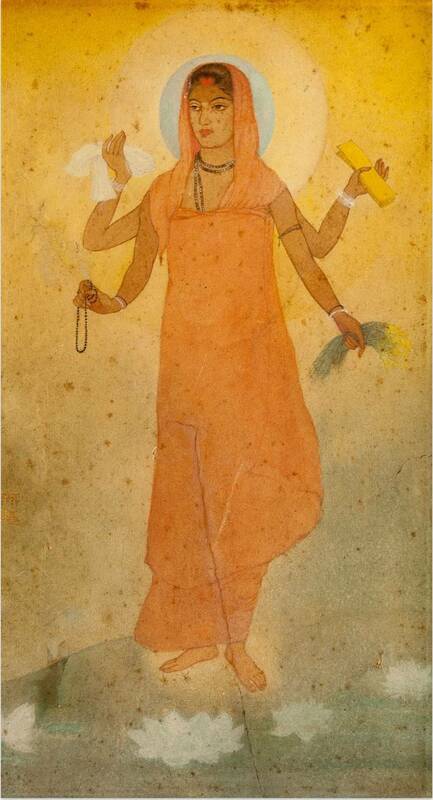 In 1905, Abanindranath Tagore portrayed Bharat Mata as a four-armed Hindu goddess wearing saffron colored robes, holding a book, sheaves of rice, a mala, and a white cloth. In 1936, a Bharat Mata temple was built in Benaras by Shiv Prashad Gupt and was inaugurated by Mohandas Gandhi. Two another temples at Haridwar in 1983 and at Kolkata in 2015 are founded. In the Kolkata temple, Bharat Mata is portrayed through the image of Jagattarini Durga. So, Bharat Mata is not goddess described in scriptures but the consideration of Bharat Bhumi as Mata i.e Bharat Mata is portrayed looking like goddess. Thus, the practice of worshiping Bhumi as Mata is in accordance with scripture whereas consideration of Bharat Mata as goddess Durga is feigned (the word choice may be not appropriate). Reference for historical points: Vivekananda Kendra. For further information you may refer articles from TheInidanExpress or from The Hindu. Btw, I also found one Sanskrit Shubhasita praising Bharat Mata! We all know there is no such lady like Bharat Mata. It is just the creativity of an artist. I can show you many examples on the Internet, where Bharat Mata stand with Bhagwa flag. Seems clear eye creativity that shows a sign to be proud on our country and give respect to it as a Mother and visualize the importance of Tiranga Flag. 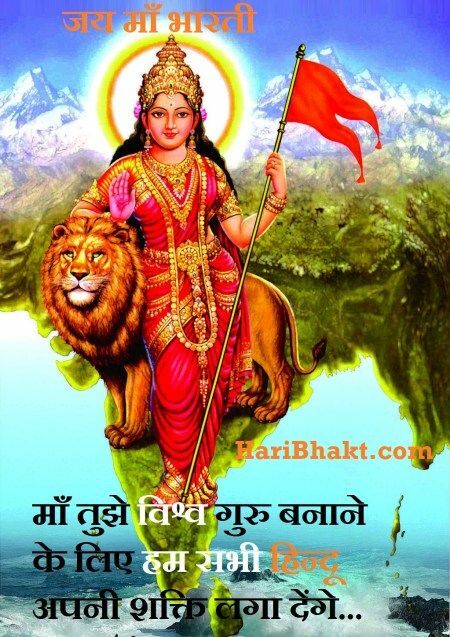 Bharat mata is a personification of the nation that is India. No mythological records exist in the Puranas or Itihasas. It was created by the nationalist leaders to inspire the national movement during the late 1890s. And as for the flag, the Indian Tricolor is a modified version of the pre-1947 official flag of the Indian National Congress. Originally the flag that Bharat mata was portrayed to hold, was the INC flag. 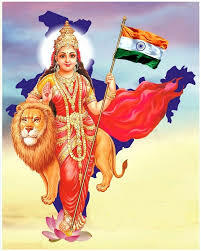 Bharat Mata is the presiding goddess of Indian Sub continent. She is known as Bharti which is another name of Saraswati. Indian people worshipped Saraswati in form of River and land since ancient times. On holding tricolour. It is a later variation of Goddess. Bankim Chandra Chatterjee says that Durga, Kali and Jaggadhatri are different forms of Maa Bharati or Bharat Mata. The Indian Culture could easily identify the Country with the Mother Goddess, because, we had in Sri Sri Chandi(chapter 11, mantra 4). O Divine Mother! You are the resort of all as you are present in form of land. janani janmabhumish cha svargaad api gariyasi Mother and Motherland are more glorious than heaven. So Bharat-Mata was seen as a form of the Mother Goddess. The Indian Tri-colour flag was introduced after independence I think. Not the answer you're looking for? Browse other questions tagged history culture goddess india . Unity in Diversity concept in ancient Hindu scriptures? Draupadi's connections with Sri Krsna and Agni Dev? How did India get its name as Bharat?